Do you need to buy an air purifier? Got new carpets, pesticide foggers, or a “mystery smoker” in your apartment building? Shared ventilation ducts in older construction? Significant other just hadta have a new “clean” polyvinylchloride shower curtain? Awwww, new kittens.....Oh boy, get ready to pay. Vendors of every type are at your service. With estimated sales near 4 million units sold in America last year, room air purification is a $100 million business. If you study this industry, one thing becomes obvious: the big money is flowing through slick marketing. While former market leader Sharper Image (Ionic Breeze) has disappeared, infomercials still sway a large percentage of buyers. I think we could start by choosing which air purifier(s) to avoid simply by evaluating marketing tactics! A shopping.com search for “air purifier” produced over 800 purifiers, with a plethora of makes, models, and air cleaning technologies. From personal air purification devices worn around the neck to multistage stacked technology behemoths, the choices confronting potential customers are overwhelming. Searching Google yields in excess of 6 million air cleaning web sites, employing an incredible range of sales tactics. Now I know why they say not to trust the internet! Many legitimate air purifier sites will incorporate “consumer reports” in titles and names to imply they are someone they aren’t. Then there are the merely incompetent “reviews”, which would be comical if the issue wasn’t so serious. One big mistake I see constantly in my email is folks wanting to jump at obscure machines with artsy casings or inflated performance claims. It takes thousands of air cleaners sold in a particular model before dealers will stock replacement filters. When the air cleaner needs service, only then will buyers notice the obscure website they bought through is offline or has no contact info. It doesn't take too many trips to the dumpster to make up for higher upfront costs with a quality brand and vendor. Both institutional testers (Consumer Reports and AHAM) evaluate and rank air purifiers on the basis of very brief airborne particle filtration tests. This is very misleading to consumers. Would you buy a new car solely on the basis of a single quarter mile drag strip performance? Ok, most males under 21 are excluded from the sample. The real test for purifier air cleaning effectiveness comes long after the purchase is made. Many builders cut costs in areas that affect long-term performance, knowing these are concealed. Electrostatic models require careful cleaning and maintenance to maintain the same efficiency as the day of the sale. 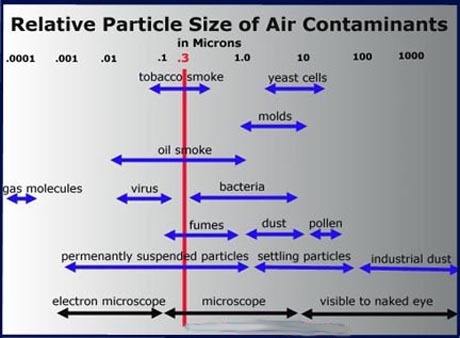 Air purifiers with cheaper HEPA-type filters, and the majority of electronic designs, will let dirty air "bypass." After a few months bypassing particles will coat the inside of the machine with a layer of fine dust. Once this happens, the bargain air cleaner becomes the biggest pollutant source in the house. I say test them under real world conditions, using actual air impurities, monitoring air filtration performance until they fail. Quality would stick out in such tests, but don't count on seeing any real soon. The Association of Home Appliance Manufacturers (AHAM), an industry trade group, conducts and publishes annual Clean Air Delivery Rate (CADR) tests. AHAM also rates air purifiers by room size, helping consumers decide among models. I use AHAM's ratings with caution, they tend to significantly overstate long term air cleaning performance. Consumer Reports (CR) tests selected air purifiers about once annually. Their rankings can make consumers purchase air purifiers in droves, and are therefore controversial. I seldom agree with CR on air cleaners. I have watched this industry grow ever since ordering my first ion generator, (it came from Sharper Image), in 1977. A few years ago there was a surge of interest in Indoor Air Quality (IAQ). As the IAQ rush worked its way down into the residential air cleaner market, thousands of air purification products emerged worldwide. Then came the crash of 2009, which proved the residential segment was overbuilt. Following the shakeout, many consumers were left with unsupported products, as builders and dealers vanished. Air purifier builders are caught, like everyone else, in the unstoppable global convergence, which will crush many small companies. To me, this says avoid air purifiers from small or startup firms. Low cost air cleaners are almost all made in mainland China now. It is hard for Americans to comprehend the crisis atmosphere and extreme haste in manufacturing there. Low end products from China have high defect rates, often colliding with the quality expectations of US consumers. Products with the highest market share are those with marketing muscle behind them, seldom the most effective at air cleaning. Cheaper brands can be found at discount department stores and home improvement retailers. I was broke, had symptoms, and bought several cheap purifiers over the years. If you are impecunious and have symptoms should you get a cheap one? Air purifier hype aside, most ozone free air purifiers are better than nothing. But it more cost effective to purchase quality at the outset than to risk your health with the short-average-service-life found in cheaper models. In my opinion, the higher priced units, properly managed, can be relatively economical long term. The trick is to keep coarse dust out of expensive filters. Conservative companies, like industry leader IQAir, keep their products stable, using modular designs with standardized filters. In contrast, Sharp Electronics, which made some very good purifiers, diluted their product offering with many new models, using a planned obsolescence marketing strategy. Many consumers were frustrated and the company lost market share. Some manufacturers sell direct, operating their own web sales. There are many knockoffs, refurbished, repaired, returned, seconds, and other questionable products at "discount" prices. Authorized dealers generally have price supports they are required to maintain. Lower prices or come-ons like “Call for price" or "Lowest prices" may signal questionable merchandise. It is common to find substitution of a third party for the manufacturer in the warranty documents of products delivered at lower prices. Many sellers make no real profits off the replacement parts, giving them little incentive to stock filters for discontinued units. Others sell the air cleaner as a loss leader, charging sky high prices for replacement air filters. Hidden restocking and shipping fees are often used to inflate a web bargains' price. Online vendors are not like brick-and-mortar stores, which must maintain relationships with a local community. Before buying at purifier sites, find out how easy it is get credit for a returned purifier, not just how easy to buy or return one. At $887, IQAir HP Plus is pricey, but long term costs can be averaged down by astute owners. The "Plus" alludes to the V5 Odor Control Cell, a strong cardboard container with five pounds of bagged charcoal and oxidizers inside. I have owned two IQAirs, trashing one after 11 years, the other still runs 24/7. IQAir HealthPro Plus at Amazon.com. Atop the mid-priced bracket, the $660 Blueair 503 is a very strong particle- getter, not as good for odors/chems. BlueAir 503 is a variant of the original 501, award winner and best seller. With BlueAir you get pricey filter programs to retain warranty, set and forget controls, and good quality. Warranty is collapsed to one year unless the buyer subscribes to the filter program, which ships filters every six months. Subscriber's warranties extend as long as they keep buying filters. Blueair 503 Air-Purifier at Amazon.com. How about the $127 50250-S, a 250 CADR dust grabber? The downside is noise, a fair amount that makes sleeping on high impossible. But 50250 is sooooo strong, I would run it as a background filter to save money on the BlueAir or IQAir replacement filters. Honeywell 50250-S True-HEPA at Amazon.com. $95, photocatalytic odor removal, and a True-HEPA, EPA Energy Star rated, amazing. The downsides are filter and UV bulb costs and some noise. There will be some fine bypassing, I recommend scotch tape at the HEPA filter's edges. This will pay off in reduced work as the purifier fills with fine dirt and wants cleaning. GermGuardian AC4825 Air Cleaning System with True HEPA, UV-C photocatalytic, and Odor Reduction, is a 22 inch tower, ideal for a small room (Max 125 sq. ft.) or student dorm. A single manual rotary switch sets fan speed on one of three speeds - there is no auto mode. GermGuardian AC4825 Tower at Amazon.com. End Buyer Beware, goto HomePage, "Air Purifier Reviews"